While turkey has its place at the dinner table for carnivores like me around the holidays, in burger form it can be disappointing and as dry as sawdust. 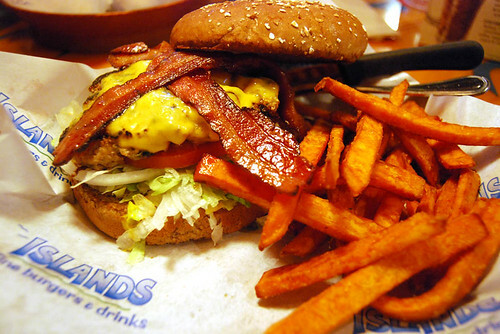 But at Islands Burgers, the restaurant breaks the trend with their turkey patty option that can grace any of their burger menu items. 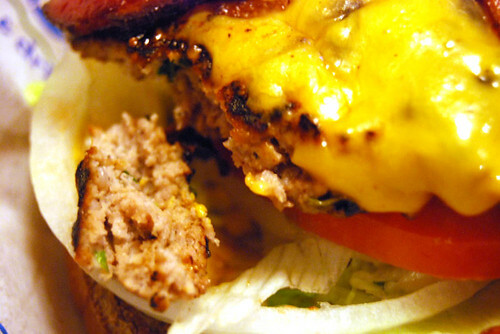 For best results, the turkey patty is best with the more traditional burgers like the Big Wave (with or without cheese) and Malibu (for those who must have bacon with their burgers). Turkey patty options are available year-round. This is a good replacement especially when paired with their lightly seasoned, crispy sweet potato fries for the full holiday dinner effect. Also not to be missed at Islands are their drinks. 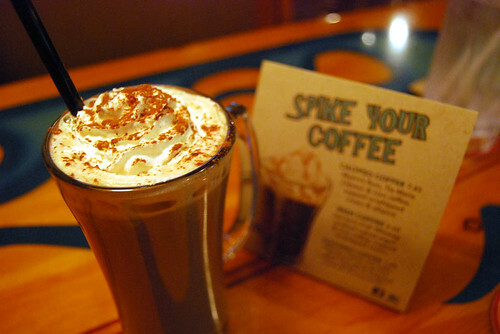 This season, they’ve introduced three coffee drinks to their line-up: Calpyso Coffee (Myer’s Rum, Tia Maria liquer, Lion coffee with cream and all spice for $7.45), Irish Coffee (Jameson Irish Whisky, sugar and coffee for $6.60) and Cocomo Coffee (Bailey’s, Patron XO Café, chocolate syrup and Lion coffee with whipped cream and cocoa for $7.45). I’m sure all are good but the best option is their Cocomo for a sweet after-dinner treat. It’s warm, rich and without a strong alcohol aftertaste. A secret menu drink not found on any Islands menu is their Pipeline Porter Float ($5.50) — two scoops of vanilla ice cream and Kona Brewing Co’s Pipeline Porter beer. 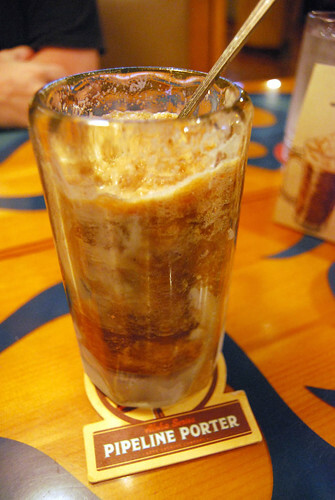 For beer aficionados, they will appreciate the malty undertones with ice cream. Since Islands is only found California, Arizona, Nevada and Hawaii, here’s my gift to you. A recipe for their Cocomo coffee drink. In a glass coffee mug, add Bailey’s Patron and chocolate syrup. Fill remainder of glass with hot coffee. Top with whipped cream and dust with cocoa. Serve immediately. The meal and products were provided compliments of Islands Restaurant. I was not compensated for my review and all opinions are my own. I choose what I want to review and how to approach them. For this review, I was intrigued by the turkey burgers (everyone I’ve ever had has been disappointing) and I’ve always been a fan of boozy coffee drinks. But I assure you, there is no San Diego food blogging mafia.